I love to share our favorite board game recommendations! Today I’m chatting about our favorite date night games – a few of the board games we love to break out when we’re looking for a quiet night at home. I’ve mentioned a few times before that Corey and I love board games. We have a pretty big collection and we play on the regular. But, I’m not talking about Monopoly and Life. I’m talking about unique, creative, and strategic board games that you never dreamed of when you were a kid. 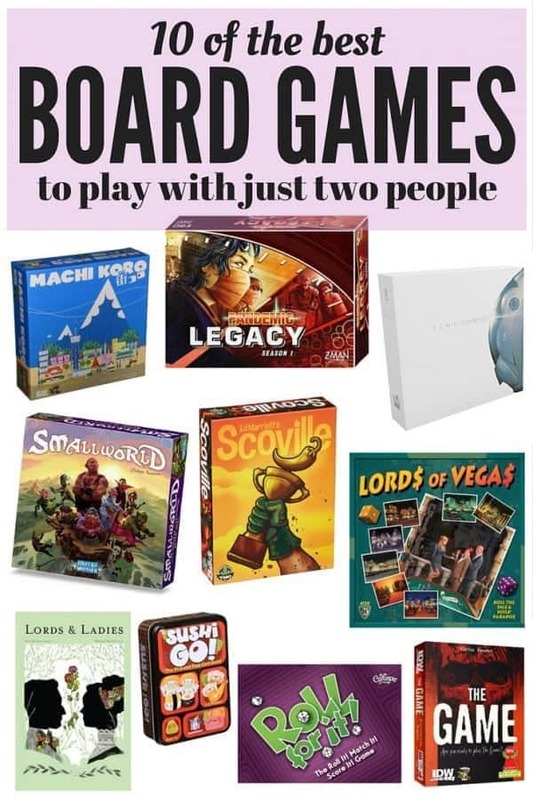 We’re always trying to recruit more people into this awesome world of board gaming, and so many people have no idea that these amazing games exist, so I thought today I’d highlight 10 of our very favorite games to play on date night. It can be hard to find games that work well with just two people, but these are the best of the best! Machi Koro – This is a fun card game where you are trying to build up a better “city” than your opponents. You buy different cards that represent buildings and earn you certain rewards, and the end goal is to finish building all of the landmarks in your city before the other person. It’s fun to see how different strategies play out in this game and it’s relatively low-key so we don’t usually have to worry about getting too competitive (because we’re both prone to that)! I highly recommend playing with the Harbor expansion if you try it and like it – it makes the game much better! Pandemic: Legacy – I didn’t think I’d like this game. Pandemic is a relatively mainstream cooperative game (meaning all players work together instead of competing) and it’s fun, but not one of my favorites. This game, however, is amazing. The idea and gameplay are identical to Pandemic – you’re playing a group of researchers/scientists who are trying to stop the spread of several highly contagious diseases around the globe. However, in the Legacy version, it’s played over 12 games and you get to alter the game board as you go, add new rules, and things are constantly shifting and changing. It’s incredibly creative and unique, and we can’t get enough! The game spans over 12 “months,” so we’ve been playing along once a month – we played the January game in January, and the February one in February, etc. This is my current favorite game! Time Stories – This is similar to Pandemic: Legacy in that it isn’t a game you can play over and over – once you beat it, it’s pretty much done, but they have different “stories” that you can buy to add to the game. In this game, you’re playing time travelers who are trying to solve mysteries together – you get to explore places and try to communicate and strategize together to figure out what’s going on. We both love mysteries and puzzles, so this is perfect for us, and it’s such an interesting game. We can’t get enough! Small World – In this game you get to choose a civilization to play (such as zombie pirates or something else equally hilarious/exciting) and you’re trying to conquer the land and bring down your opponents. It’s all about taking down the people you’re playing with, so it can get a little intense if you’re very competitive, but it’s a lot of fun! It’s a pretty quick game, and it plays really well with two people. Scoville – This game makes me laugh just because of the concept – you’re playing pepper farmers and you’re trying to grow the best, hottest peppers and earn points by making the best chili at the pepper festival. It’s silly, but requires a lot of strategy and thinking, and it’s really fun to play. This is another one where our different strategies are really highlighted, and it’s always fun to see how differently we each approach games like this! Lords of Vegas – I’ve talked about this one a few times before here, but it is hands down one of my favorites so it bears repeating. This game is similar to Monopoly, except instead of buying railroads and electric companies, you’re buying casinos and creating a mega-empire on the Vegas Strip. It’s so much fun and has a lot of mechanics that you’ll already be familiar with. Watch out, though – it can get competitive! Corey and I have had to take a break from this one before when it got too heated! Lord & Ladies – Every time we play this game we end up giggling all night. It’s all about creating the best and most prestigious family line, and creating rumors about all of the other families to take them down! It’s silly, beautifully designed, and a lot of fun to play. It’s a pretty quick game, and it’s pretty unique in the way that it’s played, so it’s a fun one to play when we’re looking for something a little different. Sushi Go – In this game, you’re trying to collect a set of sushi worth more points than your opponent. You each have a hand of cards that you pass around the table (you choose one, then pass it on, then go back and forth until the cards are all chosen), so there’s a lot of strategy in what you choose and what you decide to pass on, and it’s really fun to see how your strategy improves the more you play. It’s another one that’s really well-designed and adorable! Roll For It! – This game is very simple, but it’s very fun. You have several cards on the table with different dice combinations and each person has their own set of dice that they roll to try to match the cards. You’re racing the other person to collect cards to get a certain number of points. It’s an easy game to play while chatting, and it doesn’t take terribly long. The Game – I am obsessed with this game right now, and Corey and I are currently taking a break from it because I get a little, ahem, intense when we play. But it’s so. much. fun. It’s a cooperative card game where you have a set of cards numbered 1-100 and several piles of cards in the middle of the table where you can play them. On two of the piles, you’re counting up from 1 to 100, and on the other two you’re counting down from 100 to 1. You’re trying to get rid of as many cards as you can without actually telling your partner what is in your hand. It’s hard to beat but so much fun to play! We’ve beat it once and we were so excited! I could play this one all day long. If you haven’t ever checked out any of these more unique board games, I highly recommend that you think about doing so. It’s honestly not a hobby I ever thought I would get into, but the more games we play the more I fall in love with the hobby as a whole. It’s a great way to spend time together that’s engaging, mentally stimulating, and provides a lot of opportunity for bonding and conversation! What are your favorite board games to play? 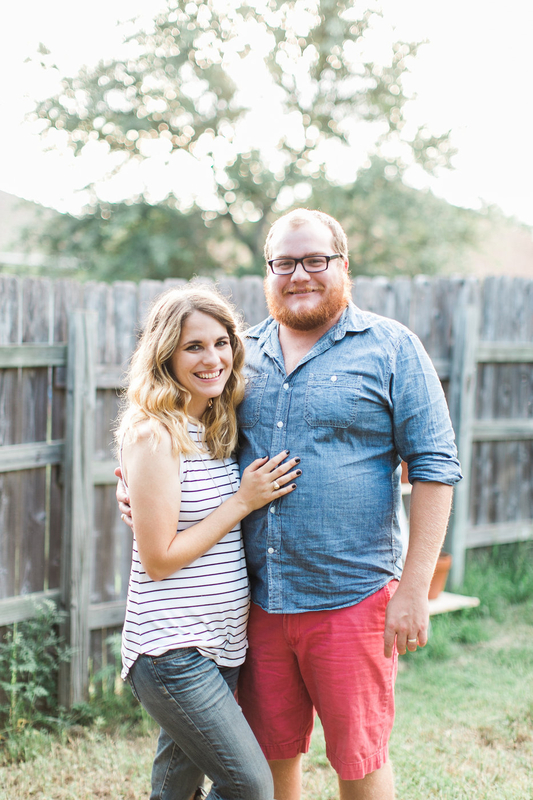 I’m looking for a fun 2-person game for at-home date nights after our son has gone to bed. We aren’t big gamers, and have never played Pandemic….would you recommend starting with that first, or going straight to Legacy? I’d probably start with Pandemic first if you aren’t familiar with gaming. Legacy is a TON of fun, but it gets complex relatively quickly, so you may want to start with something a little lighter. You’ll LOVE it! We have the card game but I also have fond memories of the board game from when i was younger. It’s a quick game that changes each time. Oh, that looks fun! I’ll definitely look into it! Your posts on great 2 player games were the inspiration for my husband and I to start buying and playing games together. (He got VERY into buying them for a while and our collection has grown way larger, way faster than I anticipated. We love Splendor so much. I also really enjoy the Lost Cities 2 person card game, Guillotine, and Elder Sign. I think Elder Sign is my husband’s favorite because it involves so many dice, and it is nice to have a fun co-op game to play. Thank you so much for these posts about 2 person board games– it has created such a fun new tradition for us! The exact same thing happened with us – Corey got a little TOO enthusiastic when we first started playing games and we ended up with an absolutely ludicrous collection. We’ve since pared it down a bit, but it’s still sizeable! I’m glad the posts are helpful! You would probably like The Village Crone. I definitely judged the game by its box and gave my husband some major side-eye when he brought it home, but despite my initial reservations/low expectations, I really liked it. It’s a bit challenging to learn, but I think the game mechanics work well and it’s a lot of fun (probably more so with 3-4 players). We have also played a lot of 2p Seven Wonders, which I really like (it’s really rather a different game than with 3p or more. I am still talking about SW itself; we’ve not tried 7W Duel). Unfortunately, the more you play SW as 2p, you get used to essentially getting more turns/cards, so it’s very hard to get out of that mindset in 3p+. Consequently, I’m very good at 2p and very bad at 3p+! Splendor is another 2p+ game. It’s an awesome game and I like it in theory, but I’m horrible at it. As far as 2p-only games, I love Jaipur. It’s very fun, easy to learn, inexpensive, and it comes in a small box. Babel can be fun, although it can be also be very frustrating. I think we may need more practice with that one. Another new favorite game we have is Codenames. Supposedly it can be played 2p, though so far we’ve only played it with 5-6p and had a blast. Those are all great recommendations! I haven’t played Village Crones yet, I’ll have to look into it! We have 7 Wonders Duel (haven’t ever played the regular game) but we haven’t tried it yet…but I definitely know the feeling of getting used to how a game is played two-player and then struggling to adjust to more than two players! I think Jaipur is another that we have but haven’t tried yet. Codenames is a lot of fun! We usually play it in a group, I didn’t know it could be two-player either! I need to share favorite group games next…we’ve worked hard over the last few months to gather a good collection of games for big crowds, because those can be so hard to find too! Agreed. As far as group games, 7 Wonders plays up to 7p, which is semi-unusual, but I think you’d have to have players used to playing these kinds of games, or everyone would be confused. Bang! the dice game (we hated the card game) is 2p-8p. With larger groups, people die early on and have to sit out, but rounds are quick so it’s usually not an issue. We also like Avalon, which is 5-10p. I see now that it’s actually a version of the Resistance, so I’m not sure if it’s different enough to warrant having both. Loot is pretty simple, and that’s 2-8p. Another game for up to 6p is Cockroach Poker, which is a bluffing game. It can be either super boring or hysterical, depending on the people you’re playing with and how into it everyone gets. When everyone is into it, it’s incredibly fun, but I think you have to pick your group carefully. I am with you Erin, Dominion is out favorite too. There are endless combination especially if you buy the expansion sets. We also like Carcassone. That being said, some favorite 2 player games of ours – Dominion (hands down our favorite), Love Letter (we even have a Batman version), Guillotine (a recent fave and super easy), and Fluxx (we hve the Oz one but there are tons of other versions). Yes! Those are ALL great games! We’ve even played Munchkin two player – it’s not easy but it’s doable! Dead of Winter is one of my absolute favorites of all time!